Very little stands to mark the location of one of the north’s most notorious Civil War sites. But it was MacCauley’s connection between location and “memory” that stuck out for me—because there’s hardly anything at the site of Elmira’s old prison to help people remember it was there. The Elmira prison operated from July 1864 through July 1865. During that time, just over 12,000 Confederates were incarcerated there. Some 2,900 of them died, a death rate of 24.3%. Compare that to Andersonville, the most notorious of the South’s prison camps, where the death toll was 29%. A suburban neighborhood now occupies the site once occupied by rows of wooden bunk houses. 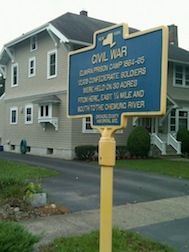 If not for a New York State historical marker in the front yard of one of those homes, along a one-way section of Water Street, a visitor could drive right by without ever knowing he was passing the prison site. 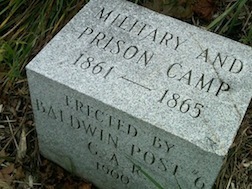 A few feet away, obscured by hostas and other landscaped perennials, a granite marker installed by the Grand Army of the Republic marks the southeast corner of the prison. Several blocks north, hunkered down in a cave-like arch carved out of an evergreen hedge, another granite block marks the location of the prison’s northeast corner. “The 30-acre compound had a 12-foot stockade fence, with catwalk and sentry boxes,” explains an interpretive sign that stands on ground owned by the City Water Authority one block to the west on Winsor Avenue. “There were 35 buildings, each about 100 feet long.” The site had formerly been a training camp, Camp Rathbun, for New York soldiers freshly mustered into Federal service. The Water Authority property is easy to miss, tucked along the dike that keeps the Chemung River flowing on course and out of the neighborhood. On one part of the lawn, the interpretive sign sits in a concrete shell that rises, sphere-like, from the ground. 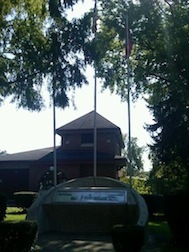 Three flagpoles, mostly obscured by trees, tower over it. But it’s the flagpole that stands a few dozen feet to the north, next to another memorial, that holds actual historical significance. It’s the same flagpole that once stood inside the main gate of the prison. The original location of the flagpole is now someone’s backyard (there’s an ivy-covered monument there, too, not accessible to the public), but the family donated the pole itself to the city, which erected it on the Water Authority property. But who travels down unknown Winsor Avenue save those people who live there or who have business with the Water Authority? 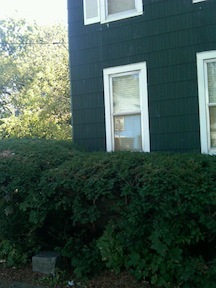 Who knows to look under the shrubs at 614 West Water Street? This place of “terrible memory” seems largely forgotten. Across town, at the National Cemetery, many of the Confederate dead still demand attention. But there, the land requires a different kind of remembering, a different kind of commemoration. Next week, I’ll take you over there for a look. This entry was posted in Battlefields & Historic Places, Memory and tagged Andersonville, Civil War prisons, Elmira, Hellmira. Bookmark the permalink. Pardon my ignorance on this subject, but what became of the compound after the war, but before the development. I could imagine the local citizens wishing to distance themselves from that segment of their history, even to the point of removing the evidence, if you will. Certainly te events that transpired on that ground deserve greater remembrance, but I can understand why it was not preserved. That would be a question I would ask as well. Additionally, I would be curious if those researchers on the grim nature of prisoners in the Civil War had uncovered the reason why so many people died at Elmira. i suspect there would be somewhat different causes of death in different prison camps. I agree with the above commenter that the “evidence” was probably removed by the good burghers of Elmira, because they would feel libeled by the continued existence of such a horrible prison in the midst of a respectable town. The cause of most of the deaths were from drinking the water from my families pond. (Foster’s Pond) The soldiers used the pond for bathing, and for going to the bathroom. Making it a haven for disease. Some good questions. I’ll dig up some answers and work them into the post I’m putting together for next week about the cemetery. In the meantime, check out The Business of Captivity in the Chemung Valley: Elmira and Its Civil War Prison by Michael Gray and Elmira: Death Camp of the North by Michael Horigan. I live in Deposit, New York, about 80 miles from Elmira. My family and I have visited the former site of “Helmira” as well as Woodlawn National Cemetery. As a Civil War historian, It is one of my main goals to perpetuate the memory of the camp and the men who died there. Inspired by the Gettysburg Daily website, I videoed about 20 areas of the camp, from the former site of the observation towers to Small Pox Island and most everything in between including the original site of the flagpole. I am conducting a program at the Sidney Memorial Public Library called, “Elmira Prison Camp:New York’s Forgotten Civil War History”, on December 7th. I have uploaded about 10 videos on Youtube already, with more to come. Sad to say but, I grew up in Elmira and had no real knowledge of any of this. I knew more about Mark Twain than the Civil War. The house I grew up in was registered with the Historical Society. Had the plaque and all. I just didn’t know details. Now, I am very interested. I am not an Elmira native, but my family (husband and 4 children) and I lived in Elmira for 12 years. I remember being a “parent chaperone” on the 6th grade field trip that my daughter took, and I assumed all 6th graders in Elmira took. It was an all day event which went over the history of Elmira in great detail, and included a visit to the grounds of “Camp Chemung” and Woodlawn Cemetery to see the graves of the Union and Confederate dead. There was another Mom who volunteered as a parent chaperone that year (1988 or 89), I believe her last name was Tice, and she was very knowledgable about the prison camp part of the trip. It makes me sad that natives of the town are ignorant of the history, but from what I hear about Elmira now, there are so many problems that the town’s history seems to have fallen by the wayside. I am a member of the 21st Georgia Volunteer Infantry reenactment group. If anyone is interested, our unit will be at Woodlawn Cemetary the first Saturday of November for a memorial service for the Civil War dead (North & South) buried there, particularly 5 men of the real 21st Georgia who died in Hellmira Prison. Anyone is welcome to come, and observe and pay your respects. Folks from our unit would be more than happy to share their knowledge of Hellmira Prison, as well as the Civil War in general with anyone interested. While most members of the 21st Georgia reside in Upstate NY, we have members from states as far away as Arizona and participate in Civil War reenactments up and down the East Coast. We recently participated in the 150th reenactment of the Battle of Gettysburg, in Gettysburg PA. Please come and join us on November 2nd. It’s great to know that Mr. Jones kept the records. He deserves recognition. Have the records been published? I would very much like to see them. 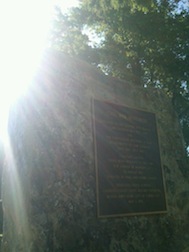 Thank you for helping to promote the history and memory of the camp. My great grand uncle died there and gggreat grandfather lived out the duration of the war here. Oh, a special thanks to Mr. Jones for keeping the records. I have visited Andersonville in Georgia and spent many hours delving into the history of it. I found it very informative and interesting. It’s a shame that Elmira Prison Camp was allowed to sink into obscurity by the residents. Yes, it isn’t something to be proud of but it is a part of the City’s history, just like Mark Twain. Almost everyone in Georgia knows the history of Andersonville but not many in New York know about “Hellmira. Does anyone in the Elmira area know if there are plans to re-create the prison to the way it was in 1864/65? Even if it isn’t on the exact site, it would be a wonderful living history outdoor museum some place in Elmira. Even Eldridge Park has been renovated. I lived in one of the water board houses until I left to go into the Army. My father, Hugh Dolaway, was in charge of the pump station and the filter plant. Looking at the pump station, our house was the one on the left. I never new of this camp until I read one of the books about it. I would very much like to see it but health reasons makes it unlikly. Thanks for making this post about Hellmira available. When Hurricane Agnes parked over southern New York in 1972, over 20 inches of rain fell in a few days. You can look it up (ie, youtube videos of Hurricane Agnes) The Chemung River flooded bigtime and took away what remained of the prison camp, being as it was right along the river. Its claimed there were brick foundations near the river inscribed with prisoner’s initials from when they would get to bathe, (maybe the Historical Society has images of them? ), all wiped out by nature, not a brick remains. If you read Horigan you will have little doubt that Stanton was behind the Southern loss of life. For example, prisoners were denied beef in their diet although it was budgeted for, because the local beef wasn’t good enough for them. As pointed out in the post, there was a huge difference between supplying food to Middle-of-nowhere, Georgia, versus a centrally located railroad depot town. 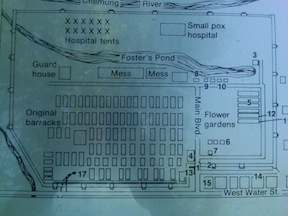 As pointed out by a previous comment, Foster’s pond, the main water supply for the prisoners, was poisonous. It was not cycled with fresh water and after a few months to drink from it was to die.